My name is Paula García-Medrano. I am a Spanish archaeologist, specialized on Early Paleolithic stone tools (raw materials, knapping processes) and specifically on the Acheulean contexts and Large Cutting Tools, its production patterns and its geographical and temporal variability. I obtained my PhD in 2011 at the University of Burgos (Spain). The main goal was to compare the Middle Pleistocene industries of Galeria and Gran Dolina-TD10.1 sites (Atapuerca, Spain) and Boxgrove (UK). Currently, I have a postdoctoral Marie Skłodowska Curie IF-EF-ST Fellow, hosted at the British Museum (London, UK). My research focuses on the Middle Pleistocene industries of the Western side of Europe. I have particular interest on the human dispersals occurring from Iberia to the North West Europe between 0.7 – 0.3 Ma, and how we could track these population dynamics through the analysis of the lithic remains. The base of my research is the combination of traditional methods of analysis on lithic tools with geometrics morphometrical analysis, 3D models, and modelling. I am member of the Atapuerca Research Team since 1999. I am currently sharing the coordination of the fieldwork in Galería site (Atapuerca, Brugos, Spain). I am also member of the Method IFG Project (CENIEH, Burgos, Spain), the Prehistoric Archaeology Research Group (University of Burgos, Spain) and the Early Societies Research Group (British Museum). Paula García-Medrano during the fieldwork season in Galeria site (Atapuerca, Spain). … And suddenly, after a long time using the traditional descriptive methods for the study of the ancient lithic technologies, it has arrived the time of exploring new tools which led us to objectify our analysis and make accessible all our work to the whole scientific community, with independence of the country where you live. 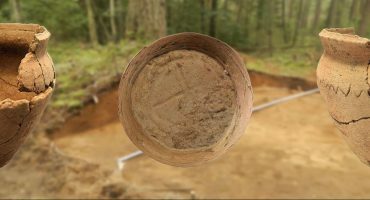 In addition, in my particular case, the lithic technology has been analysed from different points of view, using different methods depending on the country. So, one of the aims of my study is to define a common method of analysis which led us to unify the different criteria to analyse and to categorize the results, which has made it almost impossible to compare data from the different works. In this sense, I am collaborating with other specialists in lithic technology from different institutions in Europe (British Museum in UK, Musée National du Historie Naturelle in France and IPHES in Spain). Without any doubt, our 3D record will help me in this sense. 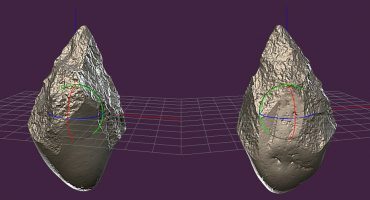 The main challenge is to use the 3D models as the base of all my geometric morphometrical analysis of Middle Pleistocene lithic tools, and in this process try to standardize what, why and how to measure the prehistoric tools. In this case, the University of Bradford and the Fragmented Heritage Project are helping me with this challenge. Scanning at the Franks House (British Museum) a handaxe from the Boxgrove collection. I am absolutely convinced that the new technologies will improve our knowledge of, in my case, the prehistoric communities, how they developed their brains to adapt to new environments using new technologies, developing them once and again. 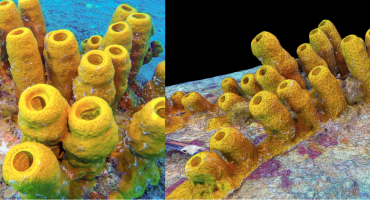 And if we are able to show not only to the rest of researchers but also to the general public all this knowledge through our 3D models, everything will be easier. I am a very new user of Sketchfab. This huge platform has opened my tiny world. I have met a lot of people from different specialties. People to whom, in our day-to-day, it would be impossible to meet. But Sketchfab has given to us the opportunity to share information, experiences and work together. I am Paula Garcia Medrano, doctor in archaeology, specialised on Middle Pleistocene industries and their production sequences and morphological variability of Large Tools. I am researcher at the British Museum, Department of Britain, Europe and Prehistory (London, UK).